Most of the associations involved in the project chose to hold awards ceremonies to present the awards to their winners. The formats of the awards varied for the different associations, with some holding large, formal events with dinner and others smaller and more informal. 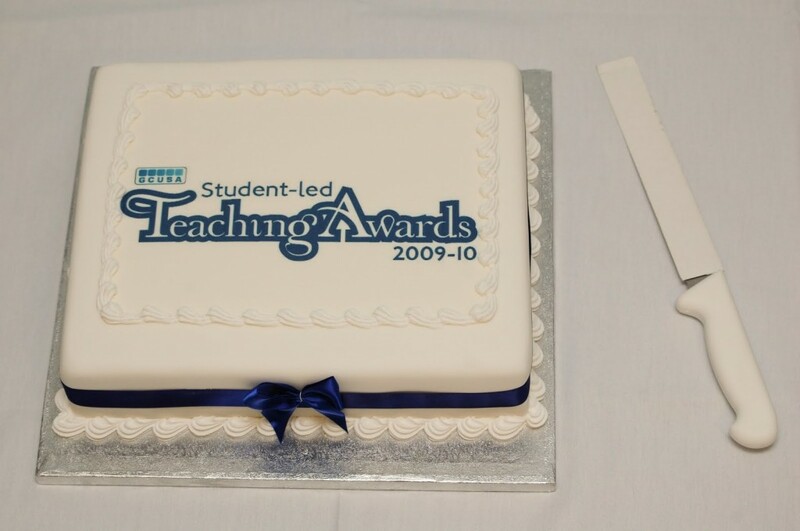 GCUSA’s included a Teaching Awards cake! Larger awards ceremonies will require more work and additional staff and financial resources, but will attract more attention both within and outside of your institution. But don’t feel you need to have a lavish ceremony – it was clear from the pilot project that staff who won awards really appreciated and enjoyed the ceremonies regardless of the size, cost, or format, and particularly enjoyed where the students who nominated them were in attendance. Many chose to hold the ceremonies in union buildings to emphasise the student element. EUSA streamed their awards ceremony live on their website for any students or staff who were unable to attend on the night but wanted to see the awards. This could be a good way of ensuring distance or part-time learners can be more involved in your awards. A number of institutions used existing events to present their awards, which is a good way to save money and organisation time, as a lot of the work will already be done. It will be important to ensure the existing event is appropriate to what you’re trying to do and doesn’t dilute your message. UHISA presented their awards at the individual graduation ceremonies of their partner organisations. As UHI is a federation of 13 colleges and research institutions across the Highlands and Islands of Scotland, it would have been impossible to bring all of the students and shortlisted staff together at one event. Handing out the awards at graduation ceremonies also helped to personalise what can often be a quite impersonal ceremony. Most invited shortlisted nominees, students, and staff and management from the institution. Having the Principal and other senior staff there will be a good way to ensure they recognise the award winners. EUSA also invited VIPs from sector organisations, such as the QAA, and local politicians. Inviting external VIPs is a good way to raise the profile of your awards. Feel free to also invite NUS Scotland and HEA! A number of associations included an opportunity on the nomination forms for students to indicate if they wished to attend the ceremonies if their choice was shortlisted, so there would be students at the event supporting the staff involved. HWUSA and others held awards ceremonies for student volunteers and class representatives at the same time, to reward their hard work and to get more people interested and involved in the work of class representatives. Make sure you use the opportunity to take lots of photographs and even short film clips of the awards ceremony, the people attending, and the award winners, to use in publicising your awards and promoting future projects. Involve more of your students (and save money) by getting student media or film and photography students in to help.